I remember two things about my first day of kindergarten. One was that my teacher was Mrs. Frost and that her name fit perfectly with her personality. So much so that by snack time on that first day I was planning her downfall, by lunch I was imagining my own, and by recess I was praying for the rapture. Which brings me to the second memory, which is of me uttering that prayer from inside a partially buried tractor tire that was part of the playground equipment. I’d hidden there as the rest of the class lined up after recess, and I planned on staying put until either Jesus came or the school year was over. Jesus didn’t come of course, but Mrs. Frost did. The subsequent chewing out she gave me remains fresh in my mind even after all these years. Mrs. Frost was not my favorite teacher, which may or may not have had something to do with the fact that I was not her favorite pupil. I was thinking about all of that two Sundays ago as I tucked my son into bed. It was an important moment, the magnitude of which was not lost on either of us. I may have been pulling the covers over a boy, but what would emerge from them the next day would be a young man. One who would trade worn pajamas and Spongebob for new jeans and a teacher. 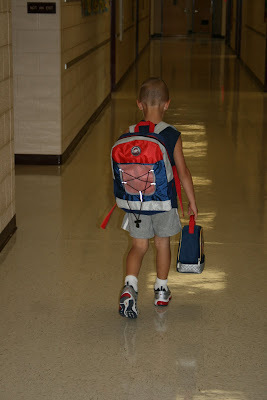 Unlike me at his age, my son was looking forward to his first day of school. It was the promise of newness that enchanted him—new clothes, new notebooks and pencils, new people and places. That night would be to him a sort of baptism. He would go to sleep one person and awake another. As I write this there are two pictures in front of me. One shows him on the front porch just before leaving for school, back straight and chin out, a smiling Alexander the Small out to defeat the world. Because new things are easy. New things are exciting. And our days were meant for conquering. The second picture was taken just a few hours later. He is slumped in his chair at school, shoulders rounded and chin tucked. His smile is still there, though barely and forced. And his new Lightning McQueen book bag is shoved to the side and all but forgotten. What happened? Simple. My son had discovered in the span of two hours one of life’s most difficult lessons to learn—not all of our days are meant for conquering. Sometimes the best we can do is survive them. And he survived. He did not hide in playground equipment and did not get yelled at by his teacher. There was no plotting of anyone’s downfall. In fact, he came home smiling. All because he learned how to turn a bad day upside down. That second picture I was telling you about? The one with the slumped shoulders and the forced smile? That’s rule number one—smile anyway. It might be difficult and it might not look pretty, but sometimes thinking you’re happy will make you so. My experience anyway. He made friends, too. Fellow castaways on the strange island of Education. Boys and girls who weren’t having such a great day themselves, but who banded together because of it. Which just goes to show that misery may indeed love company, but only so a little happiness can sprout. And he played. He ran and jumped and colored and stood in the sun. He felt better after that, he told me. I could see why. Playing makes any day a good one, even if it’s really sort of bad. But most of all? He prayed. Not aloud, and not so anyone would notice. Such things are frowned upon in public schools. Instead, he kept his eyes and ears open, trusting that God would do two things: get him through the day, and get him home. I’ll always remember my first day of kindergarten, though maybe for the wrong reasons. I hope my son remembers his, too. I know I will. Because he taught me what we’re all supposed to do when our days start out heading north only to take a sudden turn southward.